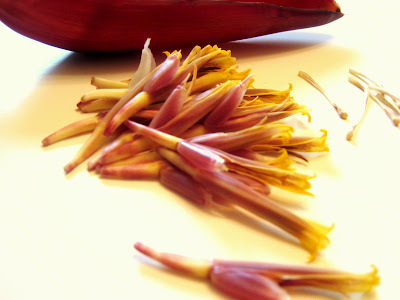 The deep purplish-crimson-colored Vazhai Poo/banana flower used as a vegetable is a little starchy and bitter. 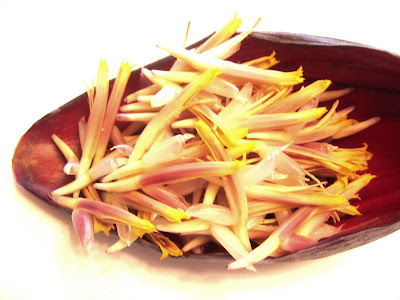 The flower has many nutrients but due to its elaborate preparation procedure and bitter taste, some are hesitant to try it. When cooked with right ingredients, many tasty dishes can be prepared. The Vadai is one such dish. 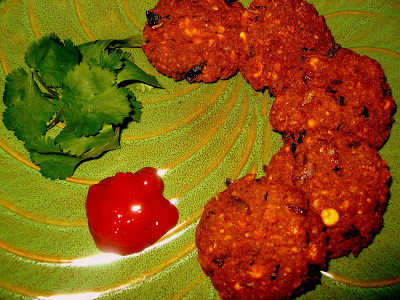 The Vazhai Poo vadai gained more popularity when it featured in the movie “KanduKonden KanduKonden”- Srividya to make a living, makes Vazhai Poo Vadai`s in the movie. Vazhai Poo was a rare find in Secunderabad. 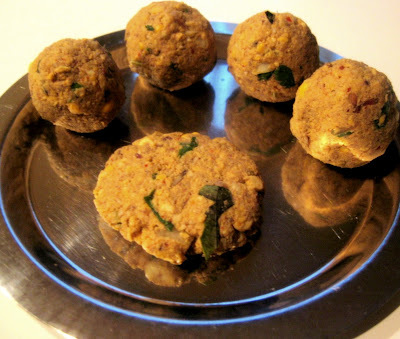 When I moved to Chennai after marriage, Athai made these Vadai`s, they were very tasty contrary to the taste I had imagined. I learn recipes when they taste good so how could I miss this one. She believed the Vazhaipoo from Trichy were better than the ones we get in Chennai. She got about 5 to 6 of them whenever she visited Trichy and the following week would be Vazhaipoo Vaaram ( week). 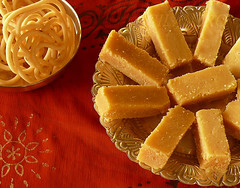 From Kootu, poriyal, usili and the vadai. I could not resist when I saw the fresh and bright Vazhai Poo at the store this week- Vazhaipoo is something precious to me especially in this part of the world. The procedure is a little elaborate; I have given instructions and some photos to make it easier-Good things in life do not come easy. Preparation: To prepare the flower for cooking, discard the first two or three sepals –Peeling back the dark sepals will reveal small-elongated white or yellow flowers. The juice will stain surfaces dark brown so rub either surfaces with oil before or use an old chopping board. . Holding the tips of the flower first chop off the base of the stem – about an inch and a half is enough, discard this piece. Holding the tip of the flower, rub a little oil on your palm and rub on top of the flower, this opens up the flower. Remove the stamen (with a thick round tip) inside. Re-apply oil and repeat the procedure until you find no more tiny flowers. This last bit inside can be eaten raw. Put the cleaned flower in a vessel with water mixed with a tablespoon of yoghurt/ curd. Set aside for about 12 hrs. This process will remove the bitterness. Peeling back the dark sepals will reveal small-elongated white or yellow flowers.My contribution to Click- AU NATUREL Photo Event at "Jugalbandi"
Remove the stamen (with a thick round tip) inside. 1 Vazhai Poo/Banana flower (size shown in pic) . 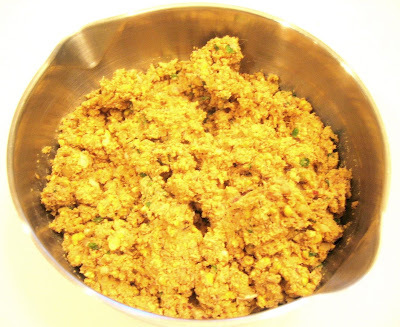 Soak the kadalai paruppu/bengal gram for half an hour. In a kadai/pan add the flowers and 1/4 cup of water. When the water boils simmer for about 5 minutes. This will cook the flowers. Drain the water and keep aside. In a mixer grind the ingredients in Set 2 to a fine paste, then add the cooked flowers . Grind and keep aside. Coarse grind the kadalai paruppu/bengal gram. Mix all of the above with the ingredients in Set 3. Make urundai`s and flatten as shown in picture. Heat oil and deep fry the vadai`s. VERY DELICIOUS ITEM, ALSO GOOD FOR HEALTH. Thank You Meera and Nandini. I tried this recipe yesterday and it came out very well. 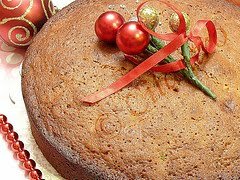 Thanks for a wonderful recipe. Thanks Pavani and Thaarini, Do try and let me know. Thanks Divya, for trying it out and your feedback. You've posted a lot of wonderful veg recipes. Pls post some more non veg receipes too. I would love to try them. 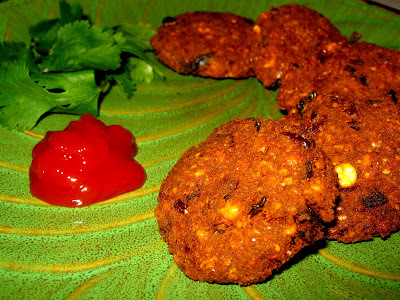 I do make these vadas frequently in india.Love the taste.I got the recipe from my mother in law. 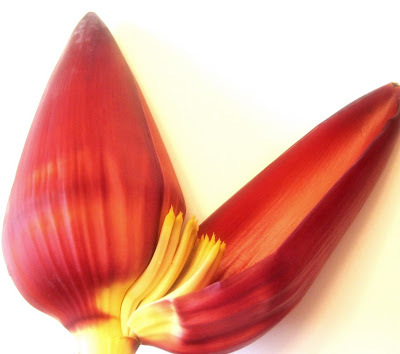 i feel it is bit expensive banana flower in us.Good for health.Came here from indiras blog. Yes it is quite expensive and not fresh all the time. I love the taste too. I am Suprised that someone from AP has so many receipes that, myself from Thanjur Dist, TamilNadu Cherish. Lovely pictures and Wonderful writing. Keep up the good work. Appreciate you Mixing Indian wih Western Ingredients to get cool receipes.